After more than a decade, J.K. Simmons is back as J. Jonah Jameson. Sadly, it's not in an official capacity, but it's no less delightful and we'll take what we can get. The Oscar-winning actor appeared very memorably as the man in charge of the Daily Bugle in Sam Raimi's Spider-Man trilogy. Now, he's provided us with a glimpse at what it might look like if Jameson was going to be in the upcoming Avengers: Endgame. J.K. Simmons recently guested on a podcast and, being the good sport he is, agreed to do a few lines as J. Jonah Jameson that were written to take place after the events of Infinity War following Thanos' very deadly finger snap. The lines were later brought to life with animation. Jameson is in the Daily Bugle offices and pitching some headlines, rather insensitively, which is very on-point for him, in the aftermath of the snap. He cooks up gems such as this. "Spider-Man is a Dead Idiot Whose Dead as Hell"
True to form, J. Jonah Jameson decides that, since he can't help the people of New York City get over this tragedy, they might as well try to sell some papers. It's incredible to hear J.K. Simmons picking up right where he left off and, undoubtedly, if the powers that be wanted it to happen, it's clear that he could reprise the role at the drop of a hat. But is that even possible? For his part, Simmons has expressed interest in it in the past. So, ultimately, the ball would be in Marvel and Sony's court. 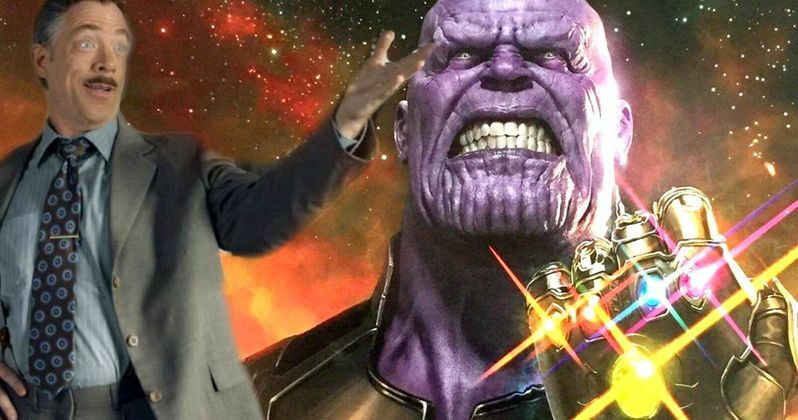 Avengers: Endgame will kick off in a world without Peter Parker, as he was dusted by Thanos. So it wouldn't make much sense to include J. Jonah Jameson in the movie, as tantalizing as this video paints it out to be. There's also no indication that he's going to show up in this summer's Spider-Man: Far From Home either. But what about in an inevitable third standalone Spidey adventure? Just go the James Bond route and bring back another character from the old franchise with the new actor. Judi Dench played M for both Pierce Brosnan and Daniel Craig. Why can't J.K. Simmons play Jameson for Tobey Maguire and Tom Holland? That may be a pipedream. J.K. Simmons took on the role of Commissioner Gordon in Justice League, which was poised to be a multi-movie run in the DC universe for him. However, things have since been retooled and it's quite possible he could have had a one-and-done go in that world. Perhaps, if the fates allow it, he could find his way back to the Marvel fold, this time within the Marvel Cinematic Universe? Probably not. But hey, at least we've got this great taste of what it could be. Be sure to check out the video from the Lights, Camera, Pod Twitter account below.